Trooper Taylor and son sue Auburn City Schools – to the TWERchives! The story broke last week and is slowly gaining steam: Auburn wide receiver’s coach Trooper Taylor and his 9th grade son are suing Auburn City Schools for racial discrimination. The issue at hand is Blaise Taylor’s refusal to trade his cornrows for a style conforming to the rules set for Auburn High School basketball players. Taylor says that removing his braids would keep him from identifying with his role models, to which TWER responds: can’t you just wear your hat backwards and wave a towel? 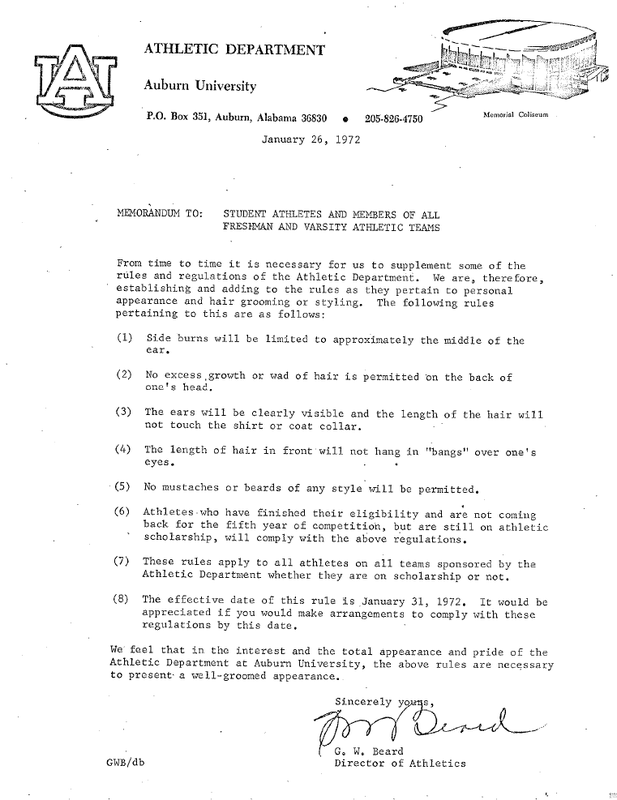 On Friday in Montgomery, the Taylors filed a federal lawsuit alleging head basketball coach Frank Tolbert’s grooming policy is racially discriminatory since it singles out a hairstyle almost exclusively worn by black players while allowing white players to wear unkempt hair. It’s the sort of town and gown clash it’s best to avoid at any of time of the year, but that it comes on the eve of one of the biggest moments in Auburn football history must for fans be particularly disconcerting. Though corn rows are not expressly prohibited, we think it’s safe to say that Shug (whose personal aesthetic dictated the standards for all athletes and who wondered why a black football player would want to wear a mustache because “Bill Cosby doesn’t wear a mustache“) would have deemed them sufficiently hippie, and objectionable enough to give Blaise the ol’ Thomas Gossom treatment. Of course, it’s 2010 — maybe even Shug would have lightened up by now. 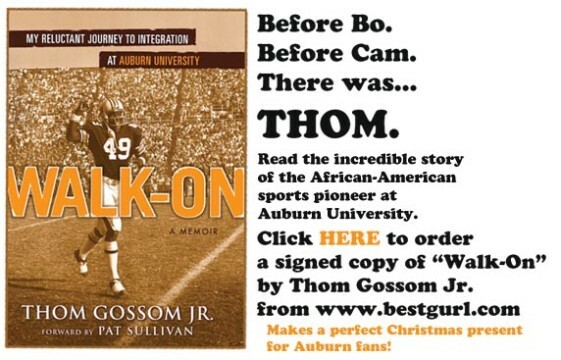 Memo courtesy of former Auburn footballer Tommy Yearout, the mystery man receiving Pat Sullivan’s hand-off at the 1971 Heisman Dinner. Frank Tolbert? Not 6-finger Frank Tolbert, right? I think the local school system has a “loser” of a case here. The kid looks neat and can’t see the problem. Guess most of the “big nasties” on the AU front line would have been booted from the local HS about two months ago. I hate that it’s come up right now. Not extremely important but still a distraction. Also, my girlfriend and I are moving up to Auburn to start a family. I hope this doesn’t cause silly dresscode necessities in he future. War eagle. What a stupid rule. It is just hair. Let the kid play and avoid a lawsuit. Talk about a win win. I agree it’s a stupid rule. Privately owned places like malls and bowling alleys can get away with it but public schools shouldn’t be allowed to dictate that sort of crap. If it doesn’t compromise the game, let him wear it however he choses. I know schools make these rules in order to “keep some kids from distracting others with their appearance,” but really… cornrows? Very neat looking cornrows at that. This is ridiculous. By Shug’s rules, we’d never have the OL tradition of growing their hair for Locks of Love. As we all know now, this was a frivilous lawsuit that got dropped. The city school had a policy in place, which basically left it up to the coach, a black coach, to set grooming standards. The policy was followed. Besides, corn rows are no longer exclusively a black thang. No discrimination. Just one family trying to get money from our city school system during a time of budget shortages. This, despite the generous salary being paid to coach Taylor by the university. I find the renewal of his contract offensive, especially the fourth year, when others were getting only three. Do we want individuals of his character coaching our young Tigers? Hopefully, the university won’t make the same mistake twice. @Gerald I don’t think this was about money. He was standing up for his sons right to wear his hair however he wants. His son isnt in JROTC or anything, he plays football. Look at how many NFL players have dreads and that is who he looks up to. I guess in Alabama you can get away with this, if they tried this in my hometown there would be huge backlash. However, your singling out of the coach for wanting to protect the identity of his son is absurd and seems like you just want a reason to trash one of our coaches. This does not hurt his character, I would have done the same for my son. Auburn is living in the stone ages. This young man did not start any trouble, corn rows were not in the prohibitions or laws!!!! They were neat. One of the best ways I feel to wear their hair. I am a conservative and I think all this bashed is mean, cruel, absurd, inane, ridiculous. These rules were written 37 years ago. My heart goes out to this young man. I taught at AHS before this incident. I know this is in the past but I am totally ashamed of AHS!